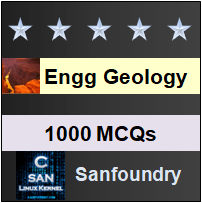 This set of Engineering Geology Multiple Choice Questions & Answers (MCQs) focuses on “Geological Work of Wind”. 1. The winds are formed basically due to which reason? Explanation: Winds are born mainly due to non-uniform heating of the surface of the earth at different places causing differences in atmospheric pressure. The pressure difference so created makes the atmospheric gases (the air) to move from areas of high pressure to areas of low pressure in the form of winds. Explanation: The process of removal of dust and sand by strong winds is called deflation. In Latin, ‘deflare’ means ‘to blow away’. It is the main process of wind erosion in desert regions. 3. The water in an oasis is obtained from which source? Explanation: Sometimes due to deflation, huge depressions are created in the deserts to such an extent that the depression becomes so deep that it intersects with the groundwater table. And it gets partially filled up with water and this is called an oasis. Explanation: The type of erosion involving rubbing, grinding, abrading and polishing the rock surfaces by any natural agent (wind, water or ice) with the help of its lead while passing over the rocks is termed as abrasion. 5. Which among the following is called “Mushroom rocks” ? Explanation: Pedestal rocks are also often called mushroom rocks because of their likeness to mushrooms popping up closely in a level land. Explanation: Ventifacts are small sized rock fragments showing one, two or three or even more typically wind-polished surfaces called faces. The polishing of different sides of originally rough fragments is caused by prolonged wind abrasion. Explanation: Factors which affect attrition by wind are nature of the region, velocity of wind and duration. It is not affected by sunlight. 8. Which of the following about saltation is not true? Explanation: The heavier and coarse sediments such as sand grains, pebbles and gravels etc. are lifted up periodically during high velocity times and only for short distances and that too for smaller heights above the ground. The uplifting of lighter particles is called suspension. 9. The transporting power of wind depends on shape of the particle. State true or false. Explanation: The transporting power of wind depends on its velocity as also on the size, shape and density of the particles. 10. Which among the following has S-shaped outline? Explanation: A typical sigmoidal dune is characterized with the absence of horns or cusps and a curved outline. In its simplest form, a sigmoidal dune is a steep sided ridge that extends in a sinuous or S-shaped outline. Explanation: Most of the dunes are migratory in nature and among all, Barchans are especially known to move ahead at the rate of 25 to 250 meters a month. Hence barchans are said to be short-lived relative to other dunes. Explanation: A typical Loess is unconsolidated, unstratified, and porous accumulation of particles of the size range 0.01-0.05 mm in diameter. This size fraction makes almost 40 percent of a particular loess deposit rest being made up of still finer clay grade material. 13. What is the term used for wind blown deposits of silt and clay grade particles? Explanation: The term loess is used for wind blown deposits of silt and clay grade particles. Dune is used to refer to sand particles. Ventifacts and hills are usually rocks. 14. Treating the sands locally with crude oil is not a method of combating the advancing sands. State true or false. Explanation: Treating the sands locally with crude oil whereby their susceptibility for transport by wind is considerably reduced. It is one of the effective methods to combat advancing sands.